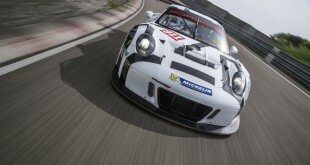 The Porsche 911 GT3 R is extremely popular for its forgiving handling and basic speed among racing customers all over the world. Now, the engine output has increased by 20hp to now deliver 500hp (368 kW). Paddle-shifts on the steering wheel ensure gear changes are even quicker and simpler, making it easier for pilots to concentrate on braking. Moreover, the transmission electronics, featuring an automatic throttle blip control, make it almost impossible to miss a gear and over-rev the engine. A softer anti-roll bar on the front axle reduces understeer. The power increase of the 4.0-litre flat six engine in the rear was achieved through optimisation of the intake system. The gearing of the sequential six-speed dog-type gearbox was adapted to the higher maximum output. In order to bring the power to the tarmac safely and to assist race drivers, the 911 GT3 R has featured a sophisticated ex-works traction control since the 2010 model year. An efficient race-ABS assists braking.